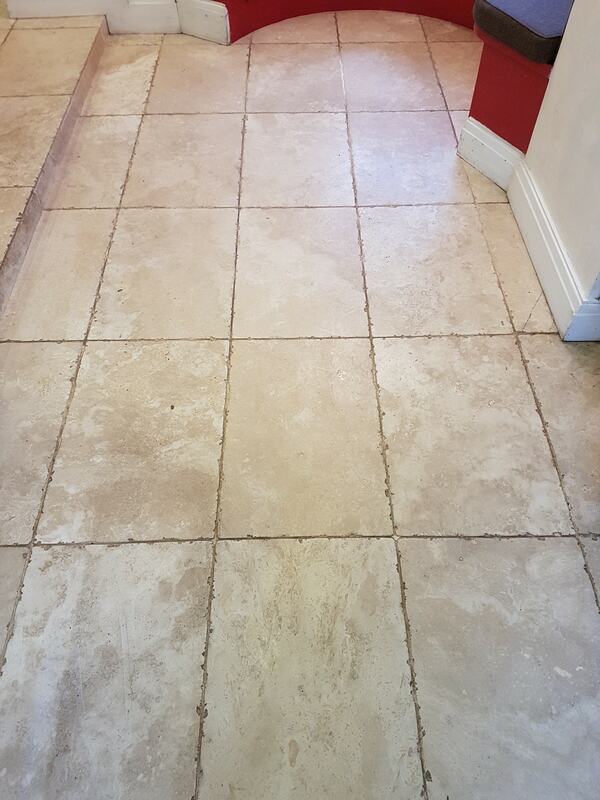 My client gave Tile Doctor a call to discuss their hallway floor which was in a poor state, they thought the tiles were Travertine but weren’t 100% sure as it was installed before they acquired the property. I arranged a time to do a site survey to see what we could do for them. The property was in Ripon which is a lovely Yorkshire cathedral city just North of Harrogate. 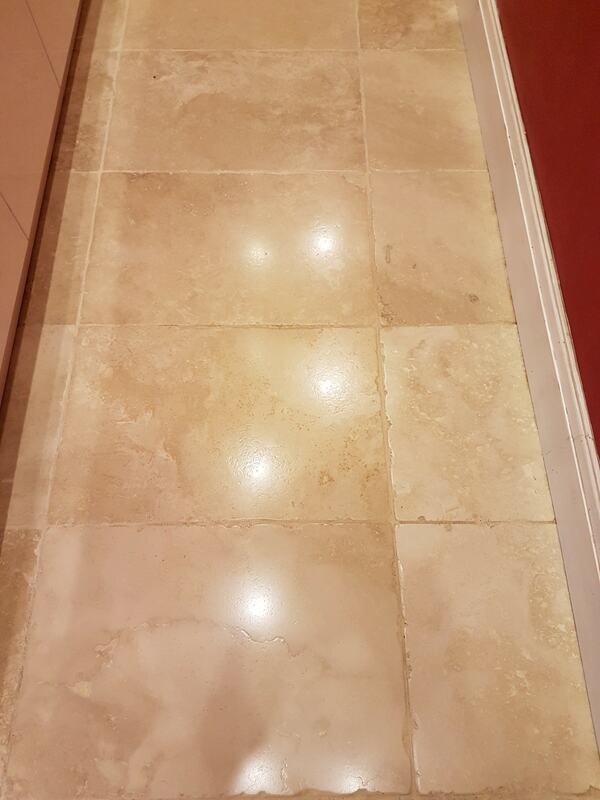 I took a look at the floor and confirmed the tiles were indeed Travertine, in fact I identified it as Bullnose Grade A Tumbled Travertine which is a premium product and well worth renovating. 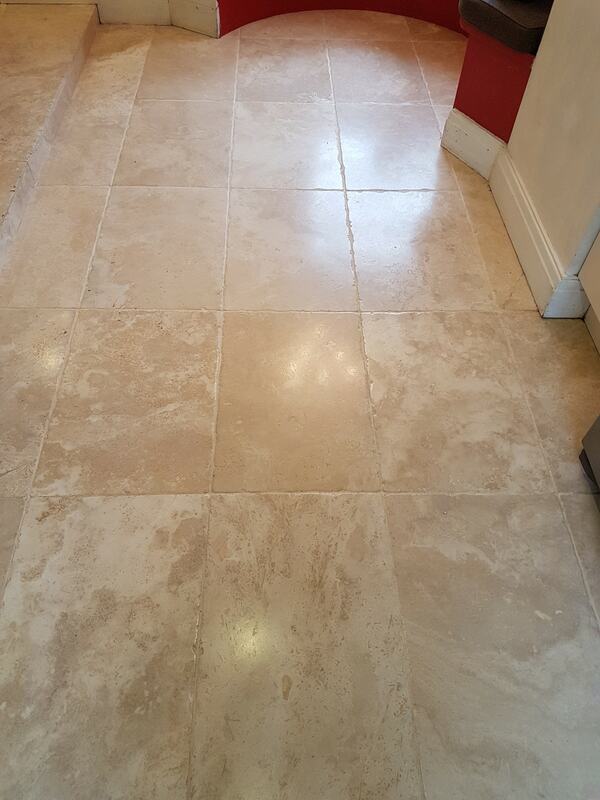 Travertine is a natural stone material that has unique features and colouring that no other stone can offer. The distinctive design and natural patterns found within the stone make it very popular as a flooring material and is often used as bathroom wall tiles too. Travertine’s durability makes it ideal for all manner of projects and it is often used externally. Like any stone floor it’s important to maintain the sealer if you want it to look its best and from what I could see the sealer had now failed and was letting dirt get into the pores of the Travertine making it very difficult to keep clean. The owners also had two dogs which may have contributed to the wear and tear. I discussed with them the prognosis and we agreed a quote for completing the work to renovate the tile and grout. I arrived the following week and started by protecting the skirting boards etc. with tape to protect them from splashing during the cleaning process. 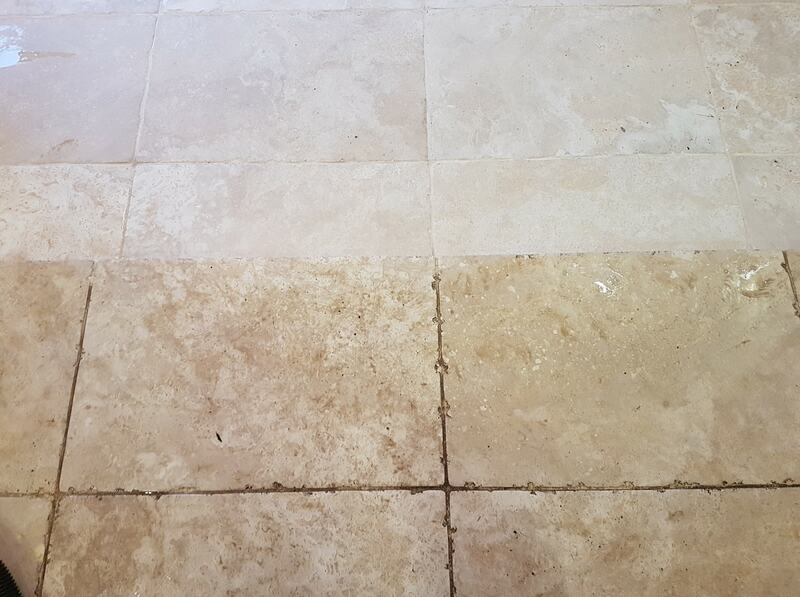 Once that was done I started burnishing the Travertine with a set of diamond burnishing pads which are run over the floor with water to remove dirt, old sealers and restore the polished appearance of the stone. Using a rotary floor machine, you start with the coarse 400-grit pad before moving onto the 800 and 1500 grit pads rinsing the floor in between each pad to remove the slurry that is generated. My next task was to tackle the cream coloured grout which had become dark with dirt. To do this I used a cleaning product called Tile Doctor Pro-Clean which is a concentrated, multi-purpose high-alkaline cleaner that’s particularly good on heavily soiled and neglected grout. You dilute it into different strengths depending on the nature of the problem and it works best when left to dwell and soak in for about ten minutes first. I scrubbed all the grout lines by hand with a scrubbing brush to get them really clean and then rinsed with water and removed the slurry with a wet vacuum. Finally, the cleaning process was completed using the last of the four burnishing pads which is a 3000-grit polishing pad which is applied dry with only a little water sprayed on the tile. 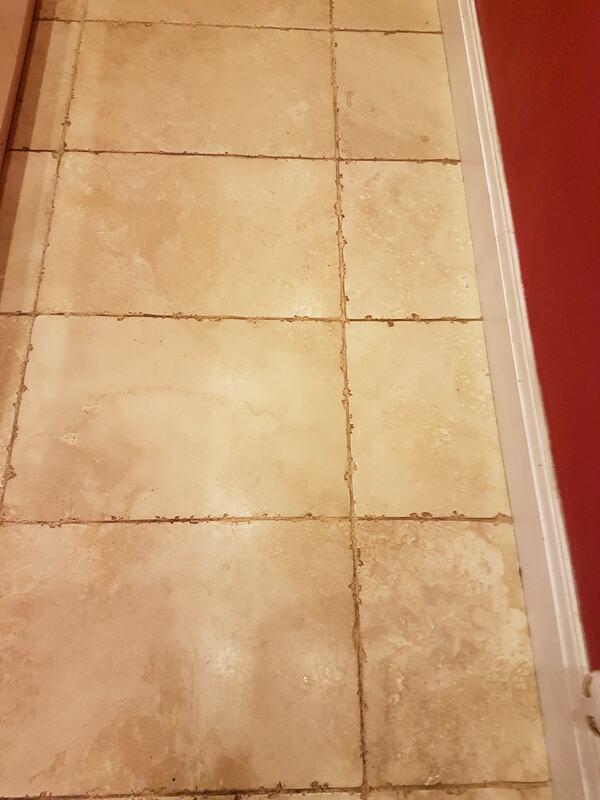 Given the size of the floor I had to work in sections and the photograph above shows the difference in the tile and grout between two of the sections. Once done the floor was left overnight to completely dry out, the warm weather made this a quick process. Returning the following morning, I used my moisture meter to test the moisture levels in the floor. Applying the sealant to a floor that is still damp prevents it from curing. I had selected to use the Tile Doctor Ultra Seal on this job, this is a premium product, which gives a no-sheen, natural-look, penetrating sealer made to provide maximum stain protection. You can also use it as a pre-grouting sealer. The customer didn’t want the floor to be shiny, so this was the perfect product for them. The customers were really satisfied with the massive transformation in the floor returning the floor to almost new. They were so pleased that the floor didn’t look tired any longer and it would now be able to withstand the traffic of their two dogs. The floor would be much easier for them to clean and maintain.